Ever get the feeling that the book you’ve just finished reading and the one by the same title being lauded in reviews isn’t the same book? That’s how I felt after finishing Caroline Overington’s latest, No Place Like Home. Overington’s previous book, Sisters of Mercy (reviewed here), had me fuming, so I wasn’t surprised to find No Place Like Home equally provocative. What did surprise me, though, was how different from mine were other reviewers’ reactions to the novel. Where I’d felt angry, by contrast, the ending left more than one other reviewer feeling sad. Whereas I found the narrator shallow and deeply problematic ethically, another thought him “likeable and moderate in his thinking”. Where I saw the majority of the characters as caricatures, others found these figures believable. Where one reviewer regarded the novel to have been written with compassion, I saw, through the eyes of a deeply flawed narrator, a disgust and contempt for the flaws of other human beings. A young man walks into a shopping centre. He’s wearing a hoodie zipped up to his neck. He starts to run, security guards start to chase him, and he gets into a shop, where he’s locked in. The idea for the reader is: Who is he? How will he get out? And will the people stuck in the shop with him also get out alive? The narrator is a former police chaplain who recounts the events of that day. No reason is given as to why this ex-priest elects to tell all – and to betray, as he does, the confidences of people whom he was paid to counsel after their ordeal. Seemingly to satisfy his own curiosity and exploit the sensationalism surrounding the day’s events, he exposes to public gaze the private foibles and flaws of those involved, their hypocrisies, narcissism and, at times, downright stupidity. There’s the bystander/victim held “hostage” by Nudie, the real estate agent from Melbourne, with his shallow, spendthrift wife, and attention-grabbing stripper girlfriend. There’s the African community worker who ran from Nudie, screaming about “evil”, instead of helping him. There’s the priest-narrator himself, lacking in self-awareness (“Everyone’s entitled to their opinion. I tend not to give mine”), standing in judgement over others while ignorantly referring to refugee boat arrivals as “illegal” and “queue-jumping”. I like reading Overington’s books, even while I suspect her politics and mine are vastly different. I like that her work provokes and outrages me, that she brings up issues of morality, ethics and social justice in her writing, and that she takes vicious stabs at “political correctness”. I don’t find her writing realistic, heartwarming or even insightful, but does it have to be? Perhaps there’s a different way of reading it. Is No Place Like Home satire? Is that how it should be read? It’s my view that Overington’s work can also be read in these terms and, as satire – a genre traditionally associated with male writers and deemed “unladylike” – it’s worth reading. [R]eviewers of the period seem to have been as likely to praise or to condemn a satirical novel based on their opinion of the author’s politics as of the author’s gender. I’d prefer not to do that. No Place Like Home is compelling reading. The reader wants to know what happens next, and along the way Overington ranges over several of the most important questions facing Australia today. What kind of country do we want to be? What kind of generation do we want to be remembered as? A generation which has allowed dog-whistle politics to whip up feelings of invasion and xenophobia, instead of tolerance and compassion? People who fail to act to restrain greenhouse gas emissions, only to have our government’s policy of “stop the boats” overwhelmed by a tidal flood of global human migration when sea levels begin to flood low-lying countries? It’s exciting to see such issues being addressed in popular fiction. One of the bonuses of reading and reviewing for the Australian Women Writers Challenge* has been discovering the diversity of political opinions among our talented contemporary women writers. I’m grateful for authors who can tackle big questions from all sides of politics – even if I don’t like the values they or their characters appear to espouse. Anger, the dominant emotion I see being conveyed and evoked by Overington’s writing, can be a powerful tool for change. Harnessed in a compelling narrative in simple-to-read language, it may reach a wide audience of people who don’t normally read. (“Not everyone knows what an inquest is,” says Overington’s priest-narrator, before going on to explain.) My hope is that this book will inspire its readers to think about the values they hold and why, not simply reinforce their prejudices. 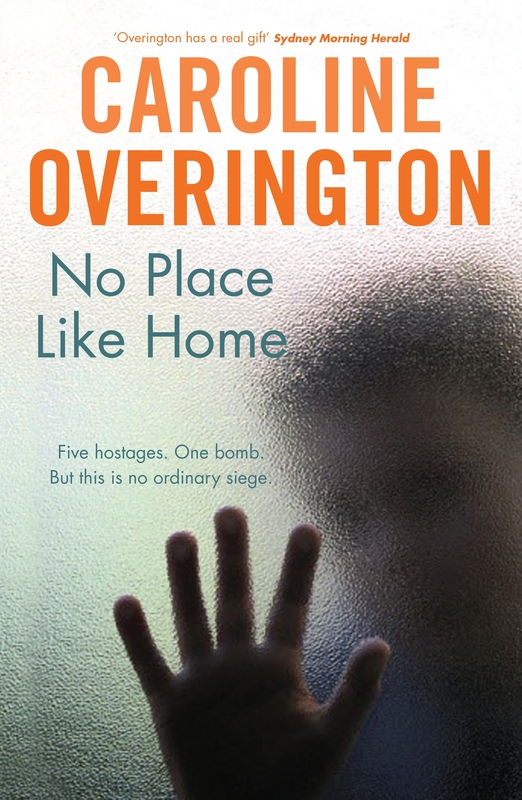 My fear is that some readers may not be able to distinguish between Overington and her ignorant narrator. Rather than criticise Overington’s work for its simplifications and the shallowness of its characters, however, I’d prefer to see it in terms of its strengths. No Place Like Home is thought-provoking and challenging, and a page-turning read. * If you’re interested in finding out more about the Australian Women Writers Challenge, please read this recent article published by if:book Australia. This review counts towards my contribution to the Australian Women Writers Challenge (AWW) and the Aussie Author Challenge. Review copy (ebook) kindly supplied by Random House Australia via Netgalley. What inspired the Australian Women Writers Challenge? What an interesting interpretation, though we share similar conclusions in that we both believe the characters and story are intended to provoke questions. In regards to the narrator though I liked the fact his ‘impartiality’ was also questionable, I think it was intentional, and there is a lot of truth in her other characters, even if a little over simplified. Thanks for the response, Shelleyrae, and apologies for the delayed reply. (This came through while we were away.) I’m looking forward to hearing what points you’ll raise with Overington during the Google+ hangout tonight. Great piece. I haven’t read anything by Overington and it doesn’t appeal to me but I really admire your capacity to interrogate your own reaction to a work.It makes for interesting reading. This is a terrific essay Elizabeth and prompts me to read the book (which I had planned to do ‘eventually’ but am now keen to do ‘soon’). I have enjoyed two of Overington’s earlier books…enjoyed even if I’ve not always agreed with everything in them…and so have some sense of the style. One of the things I liked about them was that though they did display a politics that is different to my own they generally did so in a way that challenged me to view things from a different angle than I might previously have done without being overly didactic.For many years I was a competitive debater and I’ve never found a better technique for honing my own thinking than having to passionately argue the opposite of an opinion I hold dear but novels like these do come close to providing that clarity – encouraging me to view all angles of a subject, separate facts from assumptions and to see the world from different perspectives. I’m definitely no expert on satire but will keep your thoughts in mind when I read this one. Thanks, Bernadette. I’m looking forward to hearing your take on this book. Your comments about debating are really interesting. I recently had an exchange about asylum seekers that really forced me to articulate my own stance (and back it up) and I discovered it’s not easy when the opposing viewpoint is argued forcefully. I imagine having to argue the opposite opinion from one’s own would really be a challenge – but useful, as you say.